An international team of scientists has made the first direct observation of a planet-like object orbiting a star similar to our Sun. The finding marks the first discovery made with the world's newest planet-hunting instrument on the Hawaii-based Subaru Telescope. 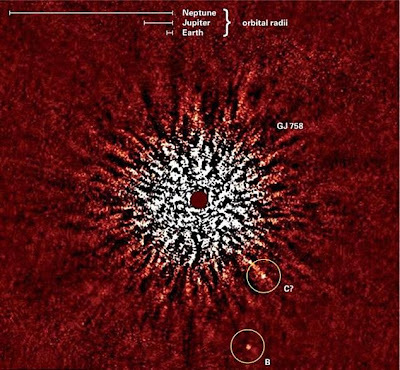 The object, known as GJ 758 B, could be a large exo-planet although it may also be a 'failed star,' known commonly as a brown dwarf. The faint companion to the sun-like star GJ 758 is estimated to be 10 to 40 times as massive as Jupiter and is a 'near neighbor' in our Milky Way galaxy, hovering 300 trillion miles from Earth. 'It's a groundbreaking find because one of the current goals of astronomy is to directly detect planet-like objects around stars like our sun,' said Dr Michael McElwain, from Princeton University. mages of the object were taken in May and August during early test runs of the new observation equipment. The team has members from Princeton, the University of Hawaii, the University of Toronto, the Max Planck Institute for Astronomy in Germany, and the National Astronomical Observatory of Japan. The results will be published in the Astrophysical Journal Letters. 'This challenging but beautiful detection of a very low mass companion to a sun-like star reminds us again how little we truly know about the census of gas giant planets and brown dwarfs around nearby stars,' said Alan Boss, from the Carnegie Institution for Science in Washington. Brown dwarfs are stars that are not massive enough to sustain fusion reactions at their core, so they burn out and cool off as they age. Finding these planets is a crucial step in answering the age-old question of the existence of extraterrestrial life. The planet-like object is currently at least 29 times as far from its star as the Earth is from the sun, approximately as far as Neptune is from the sun. However, further observations will be required to determine the actual size and shape of its orbit. At a temperature of only 600F, the object is relatively "cold" for a body of its size. It is the coldest companion to a sun-like star ever recorded in an image. The fact that such a large planet-like object appears to orbit at this location defies traditional thinking on planet formation. It is thought most larger planets are formed either closer to or farther from stars, but not in the location where GJ 758 is now. Discoveries such as this one could help theorists refine their ideas. Telescope images also revealed a second companion to the star, which the scientists have called GJ 758 C. More observations, however, are needed to confirm whether it is nearby or just looks that way. Aided by new varieties of viewing techniques, scientists started finding extrasolar planets (planets beyond the solar system) in 1992 and have located more than 400 planet-like objects so far. Most, however, have not been directly observed, but inferred from viewing the star around which the planet orbits. GJ 758 B is one of the first planet-like objects to be directly seen. Of the others that have been directly viewed, most have been on larger orbits than the distance between GJ 758 B and its star, or around stars with temperatures far above the average temperature of GJ 758 or our sun. Scientists were able to spot the object even though it was hidden in the glare of the star it orbits by subtracting out that brighter light. To do this, they used a special advanced image attached to the Subaru Telescope. Known as HiCIAO, it is part of a new generation of instruments specially made to detect faint objects near a bright star by masking its far more intense light. 'It's amazing how quickly this instrument has come online and burst into the forefront,' said Marc Kuchner, an exoplanet scientist at the NASA Goddard Space Flight Centre. 'It looks very promising,' said Christian Thalmann, one of the team's lead scientists. If it should turn out to be a second companion, he said, that would make both of them more likely to be young planets rather than old brown dwarfs, since two brown dwarfs in such close proximity would not remain stable for such a long period of time.